When you add a Swimlane to a view, it starts out with a time-based horizontal pivot, with the column headers set to Months. You can change the time period of the columns to Weeks, Quarters, Halves, or Years. 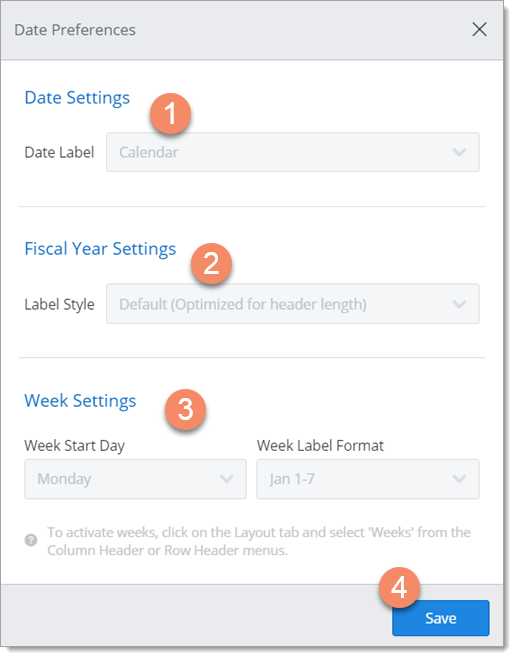 You can also set the column headers to any field in the roadmap in order to create a theme-based pivot instead. 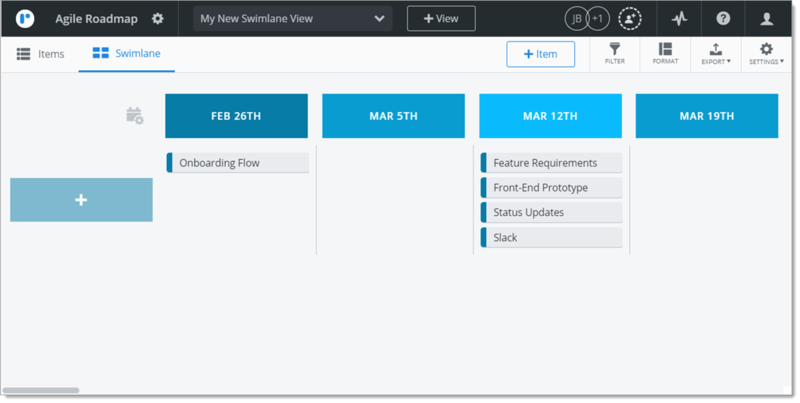 To see how, go to Add theme-based pivots to a Swimlane. If you set a Swimlane's column headers to a field to create a theme-based pivot, you can choose to make the vertical pivot a time-based pivot by setting the row headers to a time period the same way you do the column headers. Whichever headers you choose, you can have only one time-based pivot in a Swimlane. 2. In the Layout tab, click the Column Header or Row Header dropdown. 3. In the dropdown, under Default Dates, select the different time period (Weeks, Months, Quarters, Halves, Years). NOTE: You can set only one of the headers to a time period. If one of the headers is already set to a time period, the Default Dates selections in the other header's dropdown will be grayed-out. You can further customize a Swimlane's time-based pivot using the Date Preferences dialog. To open the dialog, click the Date Preferences icon to the left of the column headers. When you're done setting your preferences, click the Save button at the bottom of the dialog. NOTE: The icon is visible only if one of the Swimlane's headers is set to a time period. If your roadmap has a Fiscal Year-End, you can label the time periods in a Swimlane's column or row headers using the Calendar Year or the Fiscal Year. If your roadmap has a Fiscal Year-end and you choose to label time periods in a Swimlane's column or row headers using the Fiscal Year, you can set the format of the labels (FY 2017-2018, FY 2018, FY18, etc.). If you've set a Swimlane's column or row header to Weeks, you can choose the week start day and the format of the week label. To set the week start day, select it in the Week Start Day dropdown. To set the label format, select it in the Week Label Format dropdown. Here's a snapshot of what you're Swimlane might look like if you've set the column header time period to Weeks, the Week Start Day to Sunday, and Week Label Format to the first date of the week. At this point, your Swimlane does not row headers set yet.